I’m a minimal make-up girl. I often go out without a lick of it on unless I have a meeting or social plans. So I tend to keep my nails polished. It helps me feel…well…polished. I’m excited that interesting colors and unique designs are creeping in. When I was little I loved neon yellow polish. One of my babysitters once used pearl and that became a favorite of mine too. Once I even mixed dark purple into the pearl for a shimmery opalescent effect. These days I love bright oranges, grays, khaki greens, deep blues and every 4th nail a different color. Refinery 29 seems to be at the helm of what’s happening in nail fashion. 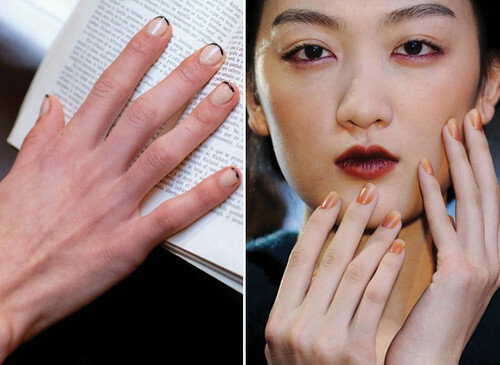 They did a great round-up of New York Fashion Week nail trends. The above two I’m dying to try. I might try pale pink and dark gray with the French manicure. The terracotta would be great to try with another color scheme too. I will have to think about that one. Have a splendid weekend! Big xoxoxoxos. Tried the nails on the left this week! Very cute..i’d love to try other colors for the tips in the future.